and wanted to share it! 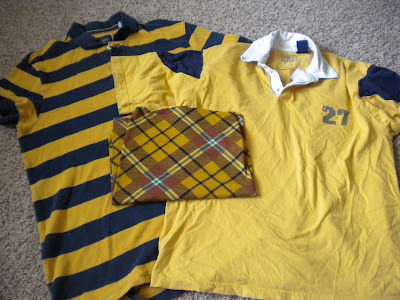 Ugly Polo type shirt, ugly rugby style shirt and some ugly plaid knit yardage. What do you think? Do they qualify as 'ugly'? I had a conversation with the fabric store lady about 'ugly fabric.' I went back to the store to get more of the ugly plaid fabric and I was explaining that I was suprised to find it gone as it was pretty darn ugly. She told me there was, "No such thing as ugly fabric." After thinking about it, I have to agree. Some of the fabric I pick out for a specific purpose could be considered ugly, but just as beauty is in the eye of the beholder, so is ugly. And when beheld with the 'eye of creation', you just never know. . . Okay, sorry for my rambling. . .
A cute little school girl, ready for Kindergarten! What a fun challenge! I can't wait to see what you have created. . .
That knit turned into a truly adorable dress!! I have to agree that maybe there's no such thing as 'ugly' fabric... What can we call it instead? Project-Specific fabric? Special fabric? aggghhhhh now I'm brainstorming a new name for ugly fabric instead of working. OH WAIT - "undesirable" fabric? Oh MY!!! This is so cute! I love everything about it! Super cute pattern, perfect choice of fabric and buttons. I also love the creative picture taking, glasses, hair, apple, pencil, desk. You are amazing! WOW the dress is super cute. Wow, that is a great improvement! My own effort at the contest ended up in a heap on the sewing room floor. Good for you! Super cute - very sweet. Super cute! Your photography skills are great too! that is great! so glad you shared it. now I need to start working on mine.